The current Toyota Tacoma has been around for awhile, albeit with some updates sprinkled in over time. Well, Toyota is apparently going to give the Taco a more meaningful update, to be revealed at next month’s Chicago Auto Show. Today the brand released the above teaser shot, showcasing a redesigned front clip design for the aging pickup. New, slimmer LED headlights are flanking a grille that appears to have a honeycomb finish similar to the 2019 RAV4. All in all, the new look is bringing the Tacoma more in line with the current family look, as noted with the 2019 RAV4 and (to a lesser degree) the 4-Runner. 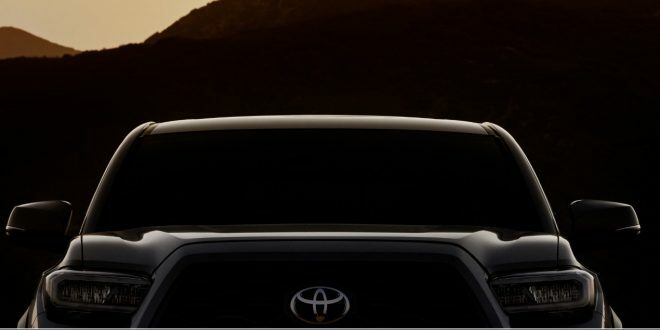 Depending on the lighting in the teaser shot, it also appears the Tacoma is getting a new hood with deeper scallops, which could indicate this redesign is more than just a fascia change. Updates beyond what the eye can see above are still to be determined. We expect to see a refreshed suite of technology features, but it’s unknown if Toyota will throw any new powertrain options in its latest midsizer. Once revealed, the 2020 Toyota Tacoma will face some increasingly stiff competition, including the all-new 2019 Ford Ranger. GM’s two midsizers–Chevrolet Colorado and GMC Canyon–have also seen incremental updates since arriving back to market in 2015. How long can the Tacoma go without a complete redesign?